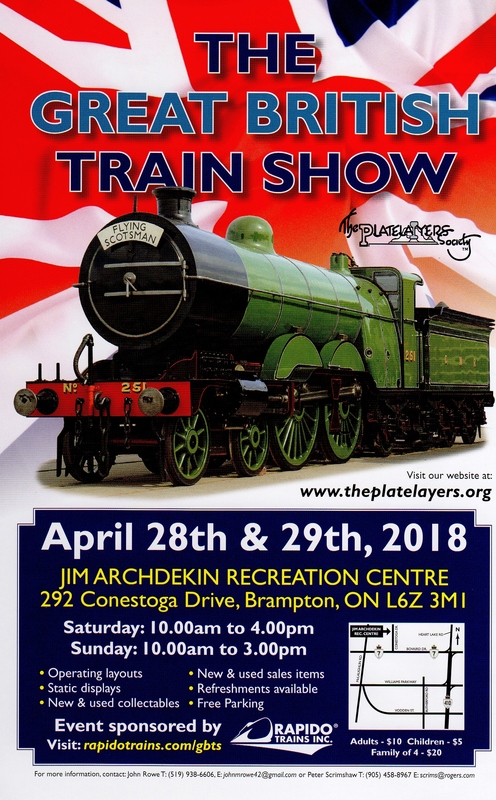 I spent a couple of enjoyable hours at the Great British Train Show in Brampton, Ontario this past Saturday. There was lots of excellent UK themed modelling on show as well as a wide assortment of vendors, er, traders present. I picked up a few attractively priced books you might be reading about in the future. I also did better on the photography compared to the Ontario Narrow Gauge Show if only because I was just a punter. In amongst a number of enjoyable chats with friends and strangers unable to dodge fast enough, I did get some shots of things that caught my eye along with the expedient of an accompanying shot of the layout name sign or description if present. Of special note where two layouts designed to be operated by the public and set at a height to encourage the short public to have a go. There were a number of children queued up to run Thomas and James around as well as operate the Witzend inglenook sidings switching puzzle. If your show doesn’t have this sort of thing, I highly recommend getting some. Edit: WordPress scrambled my photo order. A Roy C. Link export! I spent Saturday helping out at the Ontario Narrow Gauge show, Ontario’s only train show dedicated to narrow gauge modelling. Held in the historic community hall in Schomberg, ON, the show caters mostly to the narrow minded sorts with a smattering of local punters. My view for much of the day was less inspiring as I manned the ticket booth. I made up for this by chatting at everybody who stopped by (and the occasional confused art studio tour participant in need of direction). I also almost finished reading David Wright’s book on rural structure building on my phone. Not the best format for appreciating the photos but better than counting bricks on the stores across the street in the slow moments.